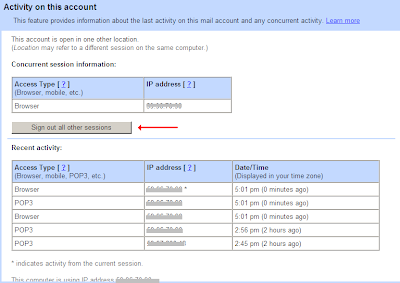 You migh have accessed gmail from a cybercafe or a public internet terminal and forgot to log out. Now you can do a remote logout also. “With this information, I can quickly verify that all the Gmail activity was indeed mine,” a Gmail developer at the official Gmail blog writes. when is this coming in or is it already in place? can you source the IP addresses to see where your page was being viewed?? this feature is already launched and is very handy. See the bottom of the inbox page. hi rohit. my friends gmail account was hacked just a few weeks back. I suppose ur blog is really helpful.